A vital drug used to help feed the tiniest babies is in such short supply that at least seven extremely premature infants in the U.S. developed horrifying skin lesions and life-threatening reactions after their hospitals ran out. “It’s very frustrating,” said Dr. Lamia Soghier, medical director of the neonatology unit at Children’s National Medical Center in Washington, D.C. “What can we do? We’re just short. We don’t have it. We can’t borrow it." The crisis is the latest in the nation’s ongoing struggle with drug shortages. After federal intervention in 2012, the number of new shortages has fallen markedly, down to just 26 this year from a record high of 267 in 2011. But the number of active shortages of essential medications -- including injectable trace elements, vitamins and electrolytes -- is now 323, higher than it’s ever been, according to the University of Utah Drug Information Service, which tracks the problem. Last December, three very premature infants at Soghier’s hospital, all born at 23 or 24 weeks of pregnancy -- suddenly developed severe diaper rash, skin erosions around their mouths and blistering lesions on their hands and feet, according to a recent CDC report. At first, doctors were stumped. The babies were all in different rooms, cared for by different nurses. They were tested for infections, drug reactions, even problems caused by medical tape. Then specialists hit on the real source: severe zinc deficiency linked to an IV food solution called total parenteral nutrition, or TPN. “These kids were not receiving food through any other method. They were exclusively on the TPN,” said Dr. Scott Norton, a dermatologist at Children's National who investigated the cases. Injectable zinc is typically added to the TPN mixture in prescribed doses for preemies. The hospital had run out of the drug on Nov. 21 following off-and-on shortages since 2010. Within weeks, the infants -- born without the boost of zinc that typically comes from the mother in the last weeks of pregnancy -- started to fail. Because they also had liver problems caused by receiving only TPN, they became even sicker, with levels of zinc 20 percent to less than 50 percent of the normal range. That’s a problem because zinc is essential for about 300 enzyme-dependent processes, Soghier said. Premature babies require large doses of zinc for cell metabolism and growth. Without it, they can face issues ranging from severe skin erosion and growth restriction to immune system problems. 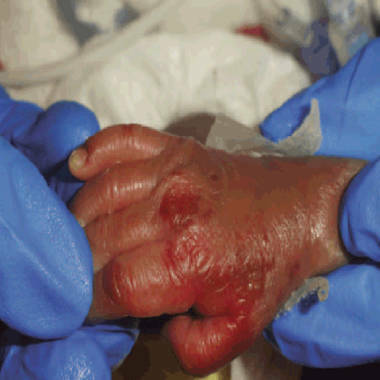 This premature baby girl was one of three infants who developed severe skin lesions and other problems at a Washington, D.C., hospital as a result of severe zinc deficiency stemming from a nationwide shortage of injectable zinc. Emergency supplies were rushed to those babies, who are now doing well, but the shortage continues, doctors say. The zinc crisis dates to 2011, when one U.S. maker of the drug -- American Regent -- suspended manufacture of most injectable products after problems with particulate matter in some drugs. The other maker of injectable zinc, Hospira, couldn’t keep up with the new demand. Hospitals across the country juggled supplies for months, but, eventually, some ran out, including Children’s National Medical Center. Doctors knew that the lack of zinc could cause problems in preemies, but they didn’t realize it would escalate so quickly, Soghier said. Such severe symptoms of zinc deficiency hadn't been seen in the U.S. for decades, Norton added. When the effect on the Children’s National patients became apparent, Hospira rushed supplies to the hospital quickly. “We managed to get an emergency shipment,” Soghier said. Slowly, the children recovered. But a query of the nation’s neonatologists by officials with the Centers for Disease Control and Prevention found more cases. In Texas, four other tiny preemies had developed the severe symptoms of zinc deficiency, said Dr. Wanda Barfield, director of the CDC’s Division of Reproductive Health. An adult dependent on TPN also showed signs of the problem, she added. Three months later, Soghier’s hospital has adequate supplies of injectable zinc, but the risk elsewhere remains high. Supplies of that drug -- and other components of TPN -- remain extremely scarce or unavailable, said Jay Mirtallo, immediate past president of the American Society for Parenteral and Enteral Nutrition, or ASPEN. “One of the biggest concerns we have is that there has been nothing that has helped and it doesn’t seem like there’s any relief in sight,” said Mirtallo. The TPN shortage affects not only premature babies, but also some 370,000 patients who receive TPN in the hospital each year, and tens of thousands more who use it at home, he said. Food and Drug Administration officials, who have struggled to address drug shortages, are aware of the problem, said Sarah Clark-Lynn, an agency spokeswoman. The agency got a boost in 2012 from a new law that requires drugmakers to report imminent shortages in advance and gives the FDA authority to speed applications from firms to make drugs in short supply. The agency has asked American Regent and Hospira to prioritize production of the injectable zinc, and they’re seeking foreign manufacturers who might be willing and able to ramp up supply, Clark-Lynn said. American Regent has resumed operations, but no injectable zinc is available yet. Hospira officials hoped to have more drug on the market by now, but the plan has been delayed. FDA officials, however, said there’s no firm timeline for either company to get injectable zinc back on hospital pharmacy shelves. In the meantime, hospitals are monitoring their tiniest patients closely and working to meet demand under difficult circumstances, said Mark Wietecha, president and chief executive of the Children’s Hospital Association, which includes 220 hospitals in the U.S. and Canada. There’s more emphasis than ever on conserving scarce drugs and prioritizing need, he said. Hospitals have been willing to share drugs in short supply because they know the next babies in need could be their own.